We’ve dubbed three of the new species as “Mini” – a group that is wholly new to science. When a whole group or “genus” like this is new to science, it needs a name, so that information about it can be accumulated with a fixed anchor. We also wanted to have a bit of fun. And so, we named the species Mini mum, Mini scule, and Mini ature. Adults of the two smallest species – Mini mum and Mini scule – are 8–11 mm, and even the largest member of the genus, Mini ature, at 15 mm, could sit on your thumbnail with room to spare. The “narrow-mouthed” frog species is part of a highly diverse family found on every continent except Antarctica and Europe. But the frogs we found on the island belong to the subfamily Cophylinae which is endemic to Madagascar. The subfamily has a particularly large diversity of miniaturised species which, based on their small size, were historically attributed to the single genus Stumpffa. Rhombophryne proportionalis from Tsaratanana in northern Madagascar is unique among Madagascar’s miniaturised frogs because it’s a proportional dwarf, meaning it has the proportions of a large frog, but is only about 12 mm long. 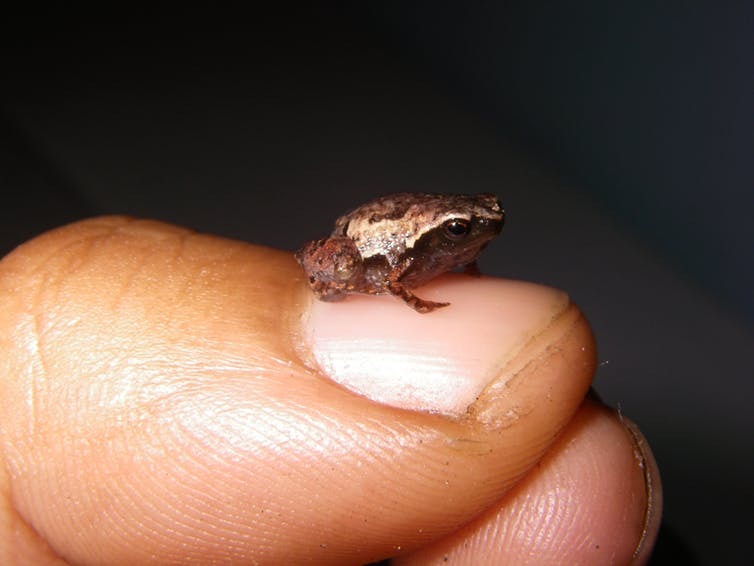 This is very unusual among tiny frogs, which usually have large eyes, big heads, and other characters that are “baby-like”; so-called “paedomorphisms”. Anodonthyla eximia from Ranomafana in eastern Madagascar is distinctly smaller than any other Anodonthyla species. It lives on the ground, providing evidence that miniaturisation and terrestriality may have an evolutionary link. Maybe getting really small makes it hard to stay up in the trees. Then there are other challenges. Cyclones often batter Madagascar’s eastern coast in the December–March rainy season, which can make searching even more difficult. We found Anodonthyla eximia in the early morning after a terrible night, when a cyclone swept away most of the camp. Miserable conditions for biologists can make great conditions for frogs. It is one of the best places in the world to study reptiles and amphibians and their evolutionary processes. But we are aware that we’re working in a very tight time frame. Madagascar’s forests are dwindling at an astounding rate. It is one of the poorest countries, and with growing populations, the forests bear the brunt of human needs. Conservation work in the country is intensifying, but there is still a long way to go before we can consider species like Mini mum and Mini scule safe for the foreseeable future. Header image: An adult male “Mini mum”, one of the world’s smallest frogs, rests on a fingernail with room to spare. Credit: Dr Andolalao Rakotoarison.